Don Mattingly would consider moving Yasiel Puig to center field, keeping Matt Kemp in right. PITTSBURGH >> It was just a thought in the middle of a July game, but it’s one that could have lasting consequences for the Dodgers. Manager Don Mattingly said that Matt Kemp looked so comfortable playing right field Monday that he entertained the thought of keeping Kemp there and moving Puig to center field. Puig has played center field in 10 games with the Dodgers, including six starts, but none this season. Kemp is starting his second straight game in right field while Puig recovers from a sore left hand. Mattingly said that Puig would be open to the move. He wouldn’t say it’s too late in the season to consider the switch. The greatest obstacle is Puig’s learning curve in center field. “He’s out of control most of the time,” Mattingly said. “I don’t mean that in a bad way but I think he kind of scares the other outfielders from the standpoint that he’s not going to give up. He’s going to catch every ball. It’s a textbook catch-22 scenario. The only way for Puig to earn the trust of Mattingly and the Dodgers’ corner outfielders is by proving he can communicate effectively in center field. But for the moment, they don’t trust him enough to use him in center field at all. There are other risks. Puig’s speed and arm strength should translate well to the position, but that might be more true in theory than in practice. 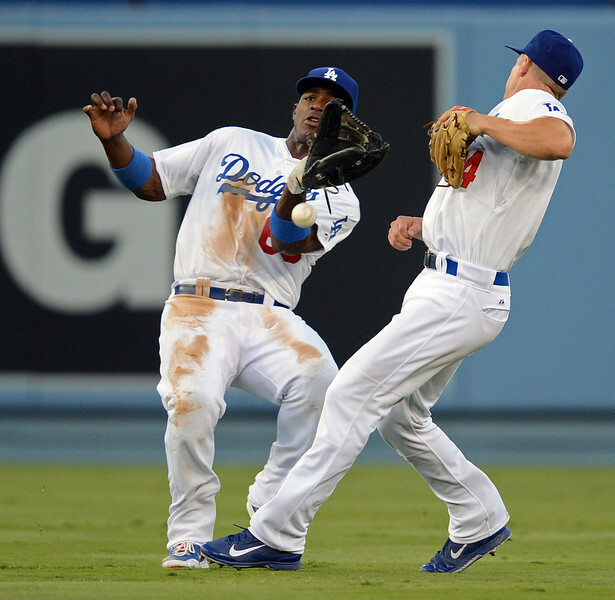 The Dodgers already moved Kemp out of center field because of his subpar defense. Andre Ethier and Scott Van Slyke have been manning the position in the meantime. But if Puig could take over center field, it could solve a recurring lineup issue. Ethier, who’s averaged 18 home runs a season and a .288 batting average the first eight years of his career, is batting .248 with four home runs. He’s been tinkering with his swing — from the set-up through the follow through — since late last season. Tuesday, he admitted that the new mechanics are going to be a work in progress the rest of the season. Kemp has been a bit harder to take out of the lineup. Since his batting average dipped to a season-low .238 on June 4, he’s batted .307 with a .840 OPS. Conversely, with rumors that the Dodgers are shopping Kemp as the July 31 trade deadline approaches, he only becomes more attractive to a team that is looking for a right fielder. One thought, many possible consequences. This entry was posted in JP on the Dodgers and tagged Andre Ethier, Matt Kemp, Yasiel Puig by J.P. Hoornstra. Bookmark the permalink.